The new morning was not better than yesterday, just a different version: cloudy, 48 degrees and wind howling across the lake. At least it wasn’t raining. While we ate steak and eggs, Brian was staring out the window at the whitecaps, I’m sure wondering what he had gotten himself into. There were suggestions of a trip to a casino, or maybe a movie day in the camper, instead of going out into these elements. How could the extended forecast from less than a week earlier be SO wrong? Just days ago we departed on this trip worried about riding and sleeping in the heat, and now this turn of events! Brian was particularly unhappy, since he had used all of his cold weather riding gear yesterday, and none of it had dried out at all overnight. His riding jacket was still very wet, but he had an idea. He asked Kathy and Ann if he could use their blow dryers to create enough warm air flow to get it dry. I noticed that he didn’t ask John and Dennis for their blow dryers…it’s definitely beneficial to have a more diverse group on the ride. Kathy and Ann obliged, and even helped, and Brian emerged less than 30 minutes later declaring success and feeling much better. On a side note, Jack “Batman” Hohag was supposed to be riding with us on this leg of our journey, but he had to bow out due to some health issues. We really missed riding and spending time with Jack, and we wish him well in his recovery. Jack, you better hurry back; Brian is quickly becoming Doug’s new favorite rider, so you have competition. Hope to see you again next year! 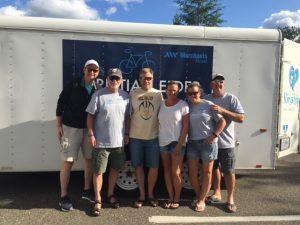 We departed the Akeley campground with the knowledge that the wind was blowing out of the west and switching to the northwest as we headed east and turned to the south on our first 21-mile segment. So we have that going for us…which is nice. We rode an easy 4-mile stretch on the Heartland Trail before turning on the Paul Bunyan Trail for the remainder of the day. The first eight miles on the trail from here is a remote, hilly, winding path through the Chippewa National Forest, a beautiful stretch of trail. Dennis rode with Kathy through this section, since she doesn’t like the feeling of remoteness since spotting a bear on the Mesabi Trail and taking a fall on the Munger Trail last year. John and Brian rode together also, but didn’t seem to enjoy the hills quite as much. Emerging from the forest we cruised to our first stop in Hackensack. The sun was poking through the clouds occasionally, and it was starting to warm a bit, so we all stripped a layer of clothing before riding out of town. This was to be a theme for the day. 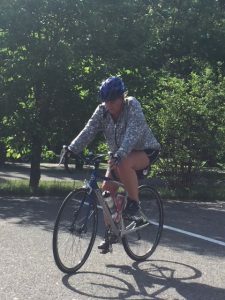 The wind continued to mostly push us along as we pedaled through Backus and Pine River to our stop in Jenkins another 23 miles down the trail. Doug and Ann had steak and chicken quesadillas waiting for us at Jenkins, which we enjoyed while relaxing in the sunshine and warming temperatures. 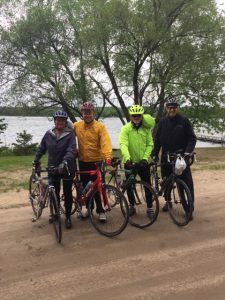 We were all invigorated for the final ride through Pequot Lakes and Nisswa to Merrifield through the lakes country, the wind still providing a push. Everyone was smiling at the finish, especially happy that the day had turned so nice and enjoyable; unlike yesterday, we all felt that we could continue riding on what had become such a beautiful day. But alas, we had reached our 62 miles, and we still had to make a long drive home. We showered and then sat around enjoying the weather for a while before driving to the Dairy Queen in Little Falls for a well-deserved treat. As we drove back to the Twin Cities, we discussed the transition to the third leg. Monday will be an off day, so there will be no diary update. 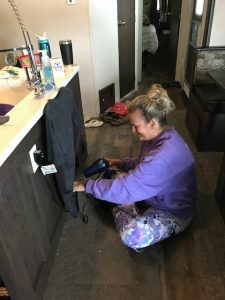 I’m sure nobody is interested in a blog about our workday or about John cleaning the RV or about whatever Kathy has planned, although her schedule sounds really full. On Tuesday John will depart with a new crew and will take over diary duties as Dennis heads back to work. I am signing off for 2018 and look forward to reading three more days of diary entries crafted by the Chairman. ← What’s the Chance That We’ll Get a Weather Window?